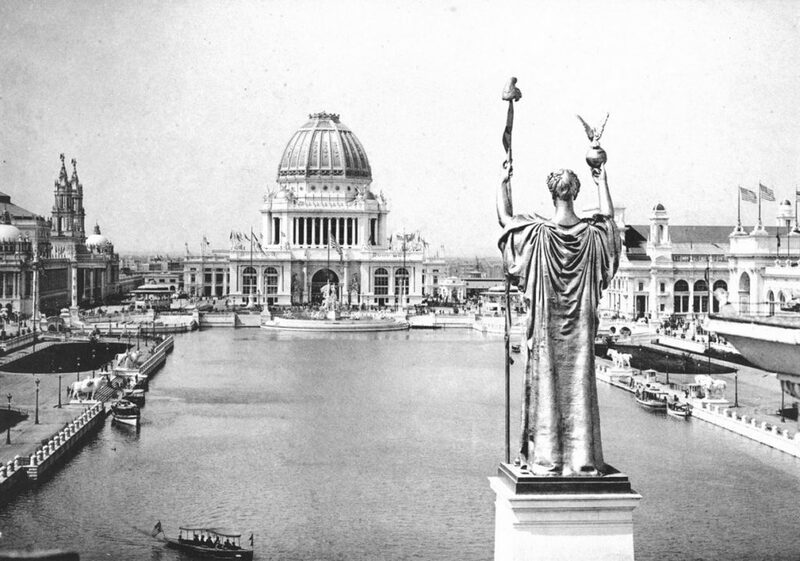 In 1901, two volumes were published containing the special reports of the awards committees for the 1893 World’s Columbian Exposition in Chicago. The highly detailed planning for the Exposition included a system of awards and committees of specialists were formed to appraise exhibitors’ products. The system at least initially was not competitive: the idea was to judge exhibits against a set list of criteria and award a prize (the same one for all) if a threshold of points was reached. The prize was a bronze medallion and an accompanying diploma or report which explained the basis for the award. For whiskies and most other spirits, four categories of criteria were established, things like chemical purity, aroma, and flavour. Each category had a maximum 25 points. If at least 80 points were achieved, the prize was awarded. For beer, a problem arose in the judging which led to a contest between America’s largest brewers, Pabst Brewing and Anheuser-Busch. Each claimed to be the “winner” (as in theory there was to be no inter-exhibitor competition). I’ll return to this subject in a future post. For spirits, the conventional system applied and gave rise to no acrimony. Guido Marx, the president of the awards committee, explained in his special report that an astonishing 5000 samples of whiskeys and other spirits were sent to Chicago for exhibition. The 10-man committee tasted every one, at the height of summer (pre-AC), as Marx dryly noted. Each country and state participating in the Exposition, almost 50 of them, submitted something. Entries were received from places as diverse as Russia, New South Wales, Haiti, Paraguay, Brazil, and one or two sultanates. There were some surprises, e.g., Cuba submitted numerous rums as expected but also submitted a brandy. Italy sent many indigenous spirits – none a grappa, as far as I can tell – but included a brandy which Marx said was a (very good) imitation of French cognac. 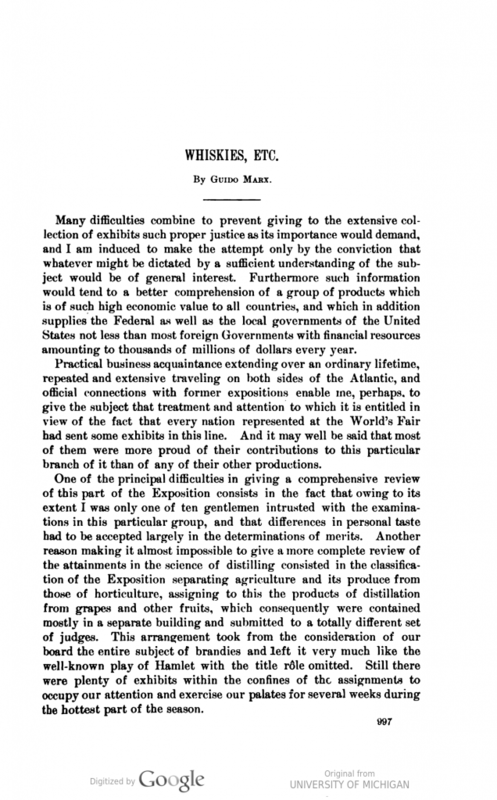 Germany and Russia both supplied whiskeys made “in the American manner” – even then. Distilling was truly global even in 1901.
Who was the impressively named Guido Marx? This gentleman was another German immigrant, and another German-Jewish one as it happens. His exodus from Germany appears not related to concerns his career would be impeded by a Jewish background. His family had converted to Protestantism, a strategy to circumvent enduring discrimination against Jews in 19th century Germany. Rather, he had participated in the 1848 Revolution. This made him persona non grata and so he left with two brothers for better prospects, in the new world. As everyone knows, Jews who became Christians were not saved from their savage fate in Nazi Germany, so the conversion strategy didn’t work, ultimately. Still, looking at it through 19th century spectacles one can’t blame people for resorting even to a self-denying device to hope for an even start in society. Guido Marx settled in Toledo, OH. He embarked on the grocery business with Rudolph Brand and this led to trading in wines and spirits. He also entered the newspaper line, editing a German-language paper for fellow-immigrants. Finally, he set up a “rectification house” that refined “high wines” (unpolished whiskey spirits) sourced from distillers in Pennsylvania, Maryland, and Kentucky. This work gave him an in-depth understanding of the variations of American and international whiskeys and other spirits whether straight, blended, flavoured, etc. His European origins and connections, and probably the German and likely the French he spoke, clearly were of interest to Exposition directors as well. He ended by presiding the internationally-composed whiskey committee. Marx was fairly prominent in public affairs as well: he had been mayor of Toledo and held other important civic posts, including with the police commission. This would have suggested probity to Exposition grandees, always important in this context, i.e., to minimize the risk of bribery by unscrupulous exhibitors, but also we think to raise the tone of a whisky competition in a time of sharply rising temperance sentiment. 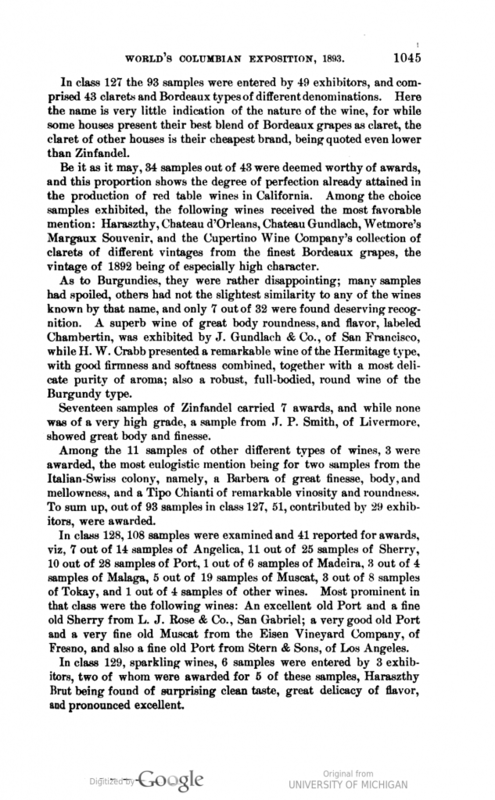 Guido Marx died in 1899 but his report, with those of the other award committees, was published in 1901. Evidently, publication was delayed for some years. This is obvious too from the format of the volumes, which is bare-bones. Cost must have been a factor in publishing them as there was no introduction. Also, only a part of the special reports was published and the list of awards was not included. Perhaps by 1901 it was felt the medal-winners weren’t relevant, or perhaps the added cost to include them was felt unwarranted. (Publication too was a federal government initiative, not private, so economy was probably a foremost consideration). What did get in the volumes was an essay from each committee head. It gave a précis and history of the industries under review and various details how the judges did their work. Marx wrote that a few hundred awards were made. He discussed various obstacles which the committee encountered. First, brandy was excluded from the committee’s remit as the Exposition had classified it as “horticultural”, not agricultural. Brandy was also exhibited in a different building from the whiskies, and appraised by different judges. Marx regretted this as he clearly viewed brandy as the king of the spirits realm. He would be surprised, probably, to see how whisky today has upended brandy from its former dominance in the world of spirits. Second, Marx ran into a problem still current today: the committee disagreed on the merits of the various entries, a problem probably exacerbated by the international composition of the panel which included representatives from the U.K., Germany, Russia, and Japan. (Marx’s co-American on the group was E. Stoddard Johnson, from Kentucky, whom we have met before in these pages). The implication was some awards made should not have been, and deserving products failed to achieve an award. Still, the committee completed its work, imperfect as it was in Marx’s eyes. There are many interesting nuggets in the account. He states only eight or nine bourbon producers in Kentucky made submissions. He felt American distilling would have done better in the awards had many more participated. Why this happened is hard to say. I’d guess the industry in Kentucky and Tennessee was still insular and the cost and trouble of an international exhibition were not magnetic. Or, perhaps the southern whiskey crowd were disenchanted with having their fine products arrayed with blended and compounded whiskeys, produced largely in the north and central-west. This leads to a further point, which is Marx’s stout defence of the blending business. His 22 page report is in no small part devoted to this topic. In his view, blending made sense, not because blended whiskey was superior to straight whiskey, but because of the lower cost of the blended item for the consumer. His experience obviously had convinced him of the merits of what is today, blended Scotch, Canadian whisky (almost all of it), and American blended whisky. Other points of interest include the fact that pre-1860, whiskey was often retailed at low proof as there was no governmental regulation of bottling proof. Marx said this encouraged the responsible use of whiskey, and abuse only started when people started drinking full-strength whiskey after the Civil War, when standards were established by government as part of the new spirits taxation. This argument may be questionable but is still interesting. Some of the established whiskey histories also advert to low-proof spirits being sold before the days of regulation. Final point: while brandies were removed from the committee’s bailiwick, some actually reached the palates of the judges, un-sated despite tasting 5000 spirits in a Chicago August. Marx explains that France had withdrawn its entries and as a result, his committee rescued the “waifs” and gave them a testing out. I don’t know why France had done this, the special report of the committee which judged brandies may explain it. Perhaps some competitive entries were labelled “Cognac” and the judges refused to exclude those, and/or the same thing happened for Champagne. But finally some choice brandy went down the rather un-dry throats of the judges of Marx’s committee. N.B. Readers interested in wines might look for the two reports on that subject in the volume linked above, they follow Marx’s article. One deals exclusively with California wines and is very interesting to read. A lot of what is taken for granted today about Napa and Sonoma quality had already started by the 1890s, especially for red wines. N.B. #2 I wonder what happened to all those samples. Could they be in a Chicago basement somewhere, maybe where the records are kept of the judges’ deliberations? How do we find out? Chicago readers…? A New Whisky From Toronto Distillery Co. This is a generally fair, and as far as I know accurate, summary -as far as it goes — of the Marx family in Toledo. The focus is on one of the 3 brothers, Guido Marx, who became mayor of Toledo at one point. The founding of the Toledo Staats Zeitung, later the Toledo Express, was not by Guido but by his brother Josef Eugen Marx, the last of the 3 brothers to move to Ohio from Germany. Josef Marx was my great grandfather on my mother’s side of the family. He was for a time the American Consul in Amsterdam, and the family has a copy of his commission by President Lincoln. About the 3rd brother, Emil Marx, I am afraid I know little. My grandfather, Guido Marx (the younger, named for his uncle) moved to California in the 1890s to become Professor of Machine Design in the then new university called Stanford, where his older brother C. D. Marx was one of the founding professors and head of Civil Engineering. That’s how our branch of the Marx family came to California, where most have remained (not including myself). Thanks for this, extremely interesting.